French inventor Henri Chrétien developed and patented a new film process that he called Anamorphoscope in 1926. It was this process that would later form the basis for CinemaScope. Chrétien's process was based on lenses that employed an optical trick which produced an image twice as wide as those that were being produced with conventional lenses; this was done using an optical system called Hypergonar, which was the process of compressing (at shoot time) and dilating (at projection time) the image laterally. He attempted to interest the motion picture industry in his invention, but at that time the industry was not sufficiently impressed. By 1950, however, cinema attendance seriously declined with the advent of a new competitive rival: television. Yet Cinerama and the early 3D films, both launched in 1952, succeeded at the box-office in defying this trend, which in turn persuaded Spyros Skouras, the head of Twentieth Century-Fox, that technical innovation could help to meet the challenge. Skouras tasked Earl Sponable, head of Fox's research department, with devising a new, impressive, projection system, but something that, unlike Cinerama, could be retrofitted to existing theatres at a relatively modest cost – and then Herbert Brag, Sponable's assistant, remembered Chrétien's "hypergonar" lens. The optical company Bausch & Lomb was asked to produce a prototype "anamorphoser" (later shortened to "anamorphic") lens. Meanwhile, Sponable tracked down Professor Chrétien, whose patent for the process had expired, so Fox purchased his existing Hypergonars from him and these lenses were flown back to Fox's studios in Hollywood. Test footage shot with these lenses was screened for Skouras, who gave the go-ahead for development of a widescreen process based on Chrétien's invention, which was to be known as "CinemaScope". Twentieth Century-Fox's pre-production of The Robe, originally committed to Technicolor Three-Strip origination, was halted so that the film could be changed to a CinemaScope production (using Eastmancolor, but processed by Technicolor). Two other CinemaScope productions were also planned: How to Marry a Millionaire and Beneath the Twelve-Mile Reef. So that production of these first CinemaScope films could proceed without delay, shooting started using the best three of Chrétien's Hypergonars while Bausch & Lomb continued working on their own versions. The introduction of CinemaScope enabled Fox and other studios to reassert its distinction from the new competitor, television. Chrétien's Hypergonars proved to have significant optical and operational defects (primarily loss-of-squeeze at close camera-to-subject distances, plus the requirement of two camera assistants). Bausch & Lomb, Fox's prime contractor for the production of these lenses, initially produced an improved "Chrétien-formula" adapter lens design (CinemaScope Adapter Type I), and subsequently produced a dramatically improved and patented "Bausch & Lomb formula" adapter lens design (CinemaScope Adapter Type II). Ultimately "Bausch & Lomb formula" "combined" lens designs incorporated both the "prime" lens and the anamorphic lens in one unit (initially in 35, 40, 50, 75, 100 and 152 mm focal lengths, and later including a 25 mm focal length). These "combined" lenses continue to be used to this day, particularly in special effects units. Other manufacturers' lenses are often preferred for so-called "production" applications that benefit from significantly lighter weight or lower distortion, or a combination of both characteristics. CinemaScope was developed to use a separate film for sound (see Audio below), thus enabling the full "silent" 1.33:1 aperture to be available for the picture, with a 2:1 anamorphic squeeze applied that would allow an aspect ratio of 2.66:1. When, however, developers found that magnetic stripes could be added to the film to produce a composite picture/sound print, the ratio of the image was reduced to 2.55:1. This reduction was kept to a minimum by reducing the width of the normal KS perforations so that they were nearly square, but of DH height. This was the CinemaScope, or CS, perforation, known colloquially as "fox-holes". Later still an optical soundtrack was added, reducing the aspect ratio further to 2.35:1. This change also meant a shift in the optical center of the projected image. All of Fox's CinemaScope films were made using a silent/full aperture for the negatives, as was this studio's practice for all films, whether anamorphic or not. In order to better hide so-called "negative assembly" splices, the ratio of the image was later changed by others to 2.39:1 and, finally, to 2.40:1. All professional cameras are capable of shooting 2.55:1 (special 'Scope aperture plate) or 2.66:1 (standard "Full"/"Silent" aperture plate, preferred by many producers and all optical houses), and 2.35:1 or 2.39:1 or 2.40:1 is simply a hard-matted version of the others. A promotional poster advertising The Robe and CinemaScope. The small box in the center represents a regular-width screen. The curvature and width of the screen have been greatly exaggerated; it looks more like a Cinerama screen. Unlike Cinerama screens, CinemaScope screens were rectangular, and only 86% wider than standard ratio. Fox selected The Robe as the first film to start production in CinemaScope, a project chosen because of its epic nature. During its production, How to Marry a Millionaire and Beneath the 12-Mile Reef also went into Cinemascope production. Millionaire finished production first, before The Robe, but because of its importance, The Robe was released first. Fox used its influential people to promote CinemaScope. With the success of The Robe and How to Marry a Millionaire, the process enjoyed success in Hollywood. Fox licensed the process to many of the major film studios including Columbia, Warner Bros., Universal, MGM and Walt Disney Productions. Walt Disney Productions was one of the first companies to license the CinemaScope process from Fox. Among the features and shorts they filmed with it, they created the live-action epic 20,000 Leagues Under the Sea, considered one of the best examples of early CinemaScope productions. Walt Disney Productions' Toot, Whistle, Plunk and Boom, which won an Academy Award for Best Short Subject (Cartoons) in 1953, was the first cartoon produced in Cinemascope. The first animated feature film to use CinemaScope was Lady and the Tramp (1955), also from Walt Disney Productions. Due to initial uncertainty about whether the process would be adopted widely, a number of films were shot simultaneously with anamorphic and regular lenses. Despite early success with the process, Fox did not shoot every production by this process. They reserved CinemaScope as a trade name for their "A" productions, while "B" productions in black and white were begun in 1956 at Fox under the trade name, "RegalScope." The latter used the very same optics as CinemaScope, but, usually, a different camera system (such as Mitchell BNCs at TCF-TV studios for RegalScope rather than Fox Studio Cameras at Fox Hills studios for CinemaScope). Fox officials were keen that the sound of their new widescreen film format should be as impressive as the picture, and that meant it should include true stereophonic sound. Previously stereo sound in the commercial cinema had always employed separate sound films, Walt Disney's 1940 release Fantasia had used a three-channel soundtrack played from separate optical film. Early post-war stereo systems used with Cinerama and some 3D films had used multichannel audio played from a separate magnetic film. Fox had initially intended to use 3-channel stereo from magnetic film for CinemaScope. However, Hazard E. Reeves' sound company had devised a method of coating 35mm stock with magnetic stripes and designed a 3-channel (left, center, right) system based on three .063" (1.6mm) wide stripes, one on each edge of the film outside the perforations, and one between the picture and the perforations in approximately the position of a standard optical soundtrack. Later it was found possible to add a narrower .029" (0.74 mm) stripe between the picture and perforations on the other side of the film; this fourth track was used for a surround channel, also sometimes known at the time as an "effects" channel. In order to avoid hiss on the surround/effects channel from distracting the audience the surround speakers were switched on by a 12 kHz tone recorded on the surround track only while wanted surround program material was present. This 4-track magnetic sound system was also used for some non-CinemaScope films; for example Fantasia was re-released in 1956, 1963, and 1969 with the original Fantasound track transferred to 4-track magnetic. CinemaScope itself was a response to early "realism" processes Cinerama and 3-D. Cinerama was relatively unaffected by CinemaScope, as it was a quality-controlled process that played in select venues, similar to the IMAX films of recent years. 3-D was hurt, however, by studio advertising surrounding CinemaScope's promise that it was the "miracle you see without glasses." Technical difficulties in presentation spelled the true end for 3-D, but studio hype was quick to hail it a "victory" for CinemaScope. In April 1953, a technique simply now known as "wide-screen" appeared and was soon adopted as a standard by all "flat" film productions in the US. In this process, a fully exposed 1.37:1 Academy ratio-area is cropped in the projector to a wide-screen aspect ratio by the use of an aperture plate, also known as a soft matte. 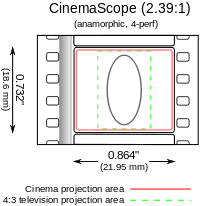 Most films shot today use this technique, cropping the top and bottom of a 1.37:1 image to produce one at a ratio of 1.85:1. Aware of Fox's upcoming CinemaScope productions, Paramount introduced this technique in March's release of Shane with the 1.66:1 aspect ratio, although the film was not shot with this ratio originally in mind. Universal-International followed suit in May with a 1.85:1 aspect ratio for Thunder Bay. By summer of 1953, Paramount, Universal, MGM, Columbia, and even Fox's B-unit contractors, under the banner of "Panoramic Productions" had switched from filming flat shows in a 1.37:1 format, and used variable flat wide-screen aspect ratios in their filming, which would become the standard of that time. By this time Chrétien's 1926 patent on the Hypergonar lens had expired while the fundamental technique that CinemaScope utilised was not patentable because the anamorphoscope had been known for centuries. Anamorphosis had been used in visual media such as Hans Holbein's painting, The Ambassadors (1533). Some studios thus sought to develop their own system rather than pay Fox. In response to the demands for a higher visual resolution spherical widescreen process, Paramount created an optical process, VistaVision, which shot horizontally on the 35 mm film roll, and then printed down to standard 4-perf vertical 35 mm. Thus, a negative with a finer grain was created and release prints had less grain. The first Paramount film in VistaVision was White Christmas. VistaVision died out in the late 1950s, with the introduction of faster film stocks. RKO used the Superscope process in which the standard 35 mm image was cropped and then optically squeezed in post-production to create an anamorphic image on film. Today's Super 35 is a variation of this process. Another process called Techniscope was developed by Technicolor Inc. in the early 1960s, using normal 35 mm cameras modified for two perforations per (half) frame instead of the regular four and later converted into an anamorphic print. Techniscope was mostly used in Europe, especially with low-budget films. Many European countries and studios used the standard anamorphic process for their wide-screen films, identical in technical specifications to CinemaScope, and renamed to avoid the trademarks of Fox. Some of these include Euroscope, Franscope, and Naturama (the latter used by Republic Pictures). In 1953, Warner Bros. also planned to develop an identical anamorphic process called Warnerscope, but after the premiere of CinemaScope, Warners decided to license it from Fox instead. A CinemaScope 35 mm film frame showing a circle. It has been squeezed by a ratio of 2:1 by an anamorphic camera lens. The anamorphic projection lens will stretch the image horizontally to show a normal round circle on the screen. Although CinemaScope was capable of producing a 2.66:1 image, the addition of magnetic sound tracks for multi-channel sound reduced this to 2.55:1. The fact that the image was expanded horizontally when projected meant that there could be visible graininess and brightness problems. To combat this, larger film formats were developed (initially a too-costly 55 mm for Carousel and The King and I) and then abandoned (both films were eventually reduction printed at 35 mm, although the aspect ratio was kept at 2.55:1). Later Fox re-released The King and I in the 65/70 mm format. The initial problems with grain and brightness were eventually reduced thanks to improvements in film stock and lenses. The CinemaScope lenses were optically flawed, however, by the fixed anamorphic element, which caused the anamorphic effect to gradually drop off as objects approached closer to the lens. The effect was that close-ups would slightly overstretch an actor's face, a problem that was soon referred to as "the mumps". This problem was avoided at first by composing wider shots, but as anamorphic technology lost its novelty, directors and cinematographers sought compositional freedom from these limitations. Issues with the lenses also made it difficult to photograph animation using the CinemaScope process. Nevertheless, many animated short films and a few features were filmed in CinemaScope during the 1950s, including Walt Disney's Lady and the Tramp (1955). Lens manufacturer Panavision was initially founded in late 1953 as a manufacturer of anamorphic lens adapters for movie projectors screening CinemaScope films, capitalizing on the success of the new anamorphic format and filling in the gap created by Bausch and Lomb's inability to mass-produce the needed adapters for movie theaters fast enough. Looking to expand beyond projector lenses, Panavision founder Robert Gottschalk soon improved upon the anamorphic camera lenses by creating a new lens set that included dual rotating anamorphic elements which were interlocked with the lens focus gearing. This innovation allowed the Panavision lenses to keep the plane of focus at a constant anamorphic ratio of 2x, thus avoiding the over-stretched "mumps" effect found in CinemaScope. After screening a demo reel comparing the two systems, many US studios adopted the Panavision anamorphic lenses. The Panavision technique was also considered more attractive to the industry because it was more affordable than CinemaScope and was not owned or licensed-out by a rival studio. Confusingly, some studios, particularly MGM, continued to use the CinemaScope credit even though they had switched to Panavision lenses. Virtually all MGM "CinemaScope" films after 1958 are actually in Panavision. By 1967, even Fox had begun to abandon CinemaScope for Panavision (famously at the demand of Frank Sinatra for Von Ryan's Express), although a significant amount of the principal photography was actually filmed using CinemaScope lenses. Fox eventually capitulated completely to third-party lenses. In Like Flint with James Coburn and Caprice with Doris Day, were Fox's final films in CinemaScope. Fox originally intended CinemaScope films to use magnetic stereo sound only, and although in certain areas, such as Los Angeles and New York City, the vast majority of theaters were equipped for 4-track magnetic sound (4-track magnetic sound achieving nearly 90 percent penetration of theaters in the greater Los Angeles area) the owners of many smaller theaters were dissatisfied with contractually having to install expensive three- or four-track magnetic stereo, and because of the technical nature of sound installations, drive-in theaters had trouble presenting stereophonic sound at all. Due to these conflicts, and because other studios were starting to release anamorphic prints with standard optical soundtracks, Fox revoked their policy of stereo-only presentations in 1957, and added a half-width optical soundtrack, while keeping the magnetic tracks for those theaters that were able to present their films with stereophonic sound. These so-called "mag-optical" prints provided a somewhat sub-standard optical sound and were also expensive to produce. It made little economic sense to supply those theaters which had only mono sound systems with an expensive striped print. Eventually Fox, and others, elected to supply the majority of their prints in standard mono optical sound form, with magnetic striped prints reserved for those theaters capable of playing them. Magnetic striped prints were expensive to produce; each print cost at least twice as much as a print with a standard optical soundtrack only. Furthermore, these striped prints wore out faster than optical prints and caused more problems in use, such as flakes of oxide clogging the replay heads. Due to these problems, and also because many cinemas never installed the necessary playback equipment, magnetic sound prints started to be made in small quantities for "roadshow" screenings only, with the main release using standard mono optical sound prints. As time went by roadshow screenings were increasingly made using 70 mm film, and the use of striped 35 mm prints declined further. Many CinemaScope films from the 1960s and 1970s were never released in stereo at all. Finally the introduction in 1976 of Dolby Stereo, which provided a similar performance to striped magnetic prints but more reliably and at a far lower cost, caused the 4-track magnetic system to become totally obsolete. While the lens system has been retired for decades, Fox has used the trademark in recent years on at least three films: Down with Love, which was shot with Panavision optics but used the credit as a throwback to the films it references, and the Don Bluth films Anastasia and Titan A.E. at Bluth's insistence. Nonetheless, these films are not true CinemaScope as they use modern lenses. CinemaScope's association with anamorphic projection is still so embedded in mass consciousness that all anamorphic prints are now referred to generically as "'Scope" prints. In the 1963 Jean-Luc Godard film Contempt (Le Mepris), filmmaker Fritz Lang makes a disparaging comment about CinemaScope: "Oh, it wasn't meant for human beings. Just for snakes – and funerals." Ironically, Contempt was shot in Franscope, a process with a similar format to CinemaScope. During the production of 1999's The Iron Giant, director Brad Bird wanted to use CinemaScope on the film's promotion, but Fox disapproved of this, so it was not used. The joke was later realized during the end credits of the 2015 "Signature Edition" re-release. ↑ "CinemaScope: Selected Documents from the Spyros P. Skouras Archive | ILIAS CHRISSOCHOIDIS". Academia.edu. 1970-01-01. Retrieved 2016-09-01. ↑ "Spyros P. Skouras, Memoirs (1893-1953) | ILIAS CHRISSOCHOIDIS". Academia.edu. 1970-01-01. Retrieved 2016-09-01. ↑ "CinemaScope at the Widescreen Museum". Widescreenmuseum.com. 1953-09-24. Retrieved 2012-06-10.